Principle 3.1(iv)* of Japan”s Corporate Governance Code (CG Code), which has been in force since June 1, requires that companies disclose their policy and procedures with regard to the appointment by the board of directors of the management team and the nomination of candidates for the positions of director and statutory auditor. In addition, Principle 3.1(v) requires that companies disclose their reasoning for choosing each person when the board of directors makes such appointments and nominations based on Principle 3.1 (iv). BDTI has conducted an analysis on the status of disclosure regarding nomination policy and procedures as well as the reasons of appointments and nominations given by the 105 listed companies that filed their corporate governance reports during the period between June 1st and November 13th. This is a translation of our Japanese report. The 105 companies we surveyed should be commended as forerunners, in view of the fact that they have filed their corporate governance reports or disclosed governance guidelines at an early date, and have made a proactive effort to respond to the CG Code. However, the level of disclosure regarding the appointment of directors and relevant procedures turned out to be far from what investors hope to receive. Many companies are insufficiently precise in their disclosure. Many of them are not clear on how they find candidates, nor do they explain their reasons for appointing them other by referring the reader to the candidates” resumes. We would hope to see greater efforts to “comply or explain” in future. It is even common for companies which state that they have put in place selection criteria to not clearly disclose the specific content of such criteria. 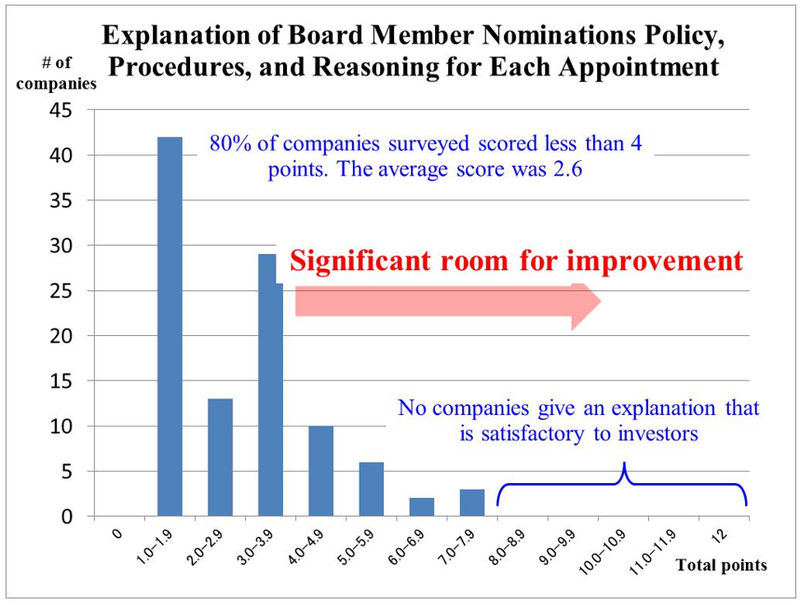 While there are 50 companies at which the board of directors has formed a committee or advisory committee on nominations, in only six of those companies are such committees comprised solely of independent or external directors. This leads us to question how objectively the search for and nomination of candidates is being handled. There was only one company which made it clear that it chooses director and statutory auditor (kansayaku) candidates from a broad universe, such as by using executive search firms and/or contacting external independent organizations. We suspect that there may be some companies which do have clear selection criteria in place for their nomination policy and procedures, and which make nominations after thoroughly considering them, but that this information does not come across to the reader in the matters they disclose. However, disclosure is meaningless if it does not communicate much to investors, and therefore we believe these situations call for improvements in the wording and methods of disclosure. Only one of the 105 companies clearly described the skills and knowledge held by their current board members. There are some companies among those we surveyed which actively make disclosure above the level required by the CG Code. We expect to see a widening difference in disclosure quality between the “leaders” and the “laggards” with respect to their corporate governance reports and guidelines. v) Explanations with respect to the individual appointments and nominations based on iv). We rated each company”s disclosure concerning its implementation of Principles 3.1(iv) and (v) as set forth in its corporate governance report (submitted to the TSE), its governance guidelines (if any), and its proxy materials for convening shareholder meetings, or other materials. We analyzed 11 factors, which were weighted for their relative significance, and calculated the overall score of each company, based on a maximum obtainable score of 12 points. There is an explanation of the factors and weighted scoring points for each factor on page 4 of this report. It is made clear that a committee or advisory committee of the board of directors is responsible for searching for, proposing or selecting the nominated candidates. 2. The relevant meeting bodies are composed of independent or external directors, and do not include non-independent executives or executive directors. There is a concrete description of the candidate search process. 2. It is made clear that candidates are chosen from a broad pool, using executive search firms and other external organizations. 3. The role of the nominations committee in searching for candidates is made clear. The skills, knowledge and experience being sought are specifically stated and are based upon the company”s needs, such as its future strategy, changes in its operating environment, the need for diversity, and so forth. 2. The skills, knowledge and experience being sought are specified and are those which a director should generally have – for example, knowledge of law, governance, accounting, finance, corporate strategy, or other subjects. Disclosures such as those that simply repeat the CG Code (e.g. “knowledge adequate for a director”) do not count. 3. It appears that either conditions 1) or 2) are applied to both directors hired from inside the company and those hired from outside. 3. The company has disclosed a summary or skill matrix in its report with respect to its current directors, showing their skills and knowledge. It is made clear that appointments are discussed by the nominations and compensation committee. It would be even better if all the members of that committee were independent or external officers. It is made clear what kind of people the board of directors appoints, from what perspective and for what purpose, and what is taken into consideration. It is made clear that the nominations and compensation committee makes appointments based on an assessment of candidates conducted through external organizations. The appointment of directors, executive officers, and Audit & Supervisory Board members is conducted in accordance with the following policies for appointment of officers. Directors and executive officers are nominated by the Board of Directors based on discussions with the Nomination and Compensation Committee. Furthermore, in the event that the Board of Directors’ appointment of an Audit & Supervisory Board member is determined by resolution at the General Meeting of Shareholders, an opportunity will be provided in advance for the Board of Directors to discuss the candidate with Audit & Supervisory Board to seek its approval. The Company supervises and guides its subsidiaries, formulating management strategies for subsidiaries engaged mainly in the P&C insurance business, as well as comprehensive management strategies for the entire Group. The company is responsible for the execution and realization of these strategies. From this perspective, the Board of Directors appoints directors based on familiarity with the Company’s business, ensuring a balance between experience and achievements without bias for an area of specialization. To facilitate objective decision making with respect to management issues from a diverse and independent focus and perspective, the Board of Directors includes multiple outside directors with a wide range of knowledge and experience having backgrounds in corporate management, academia, and the legal profession. The Audit & Supervisory Board consists of Audit & Supervisory Board members appointed on the basis of their solid knowledge of finance and accounting and in consideration of an overall balance of backgrounds in corporate management experience and the legal profession. Furthermore, the appointment of directors and Audit & Supervisory Board members is based on appointment criteria in consideration of Comprehensive Guidelines for supervision of Insurance Companies. The Group formulated outside director independence criteria as a standard for the appointment of outside directors and outside Audit & Supervisory Board members. The Group formulated a “desired image for executive officers” and “Policies for appointment of executive officers” to identify the basic skills and qualifications required and define the balance between experience and achievements when appointing executive officers. It is made clear that appointments are discussed by a nominations committee, and that all of the committee members are external directors. The skills and knowledge sought in candidates for director positions are specified. It would be even better if there was explanation of a clear, detailed process for searching for candidates, including making use of external organizations. All reasons for appointing officers are made clear in the proxy materials. 1. In the course of appointing directors who concurrently serve as executive officers, candidates to be appointed as directors are personnel who satisfy matters such as the appointment policy set out by the Nominating Committee and executive officers such as the Group CEO and others who have been delegated the duties (CFO, CRO, CCO, CSO, etc.) to carry out checks and balances with respect to the management. 2. Each candidate to be appointed as an outside director must satisfy the following in order to fully exert his or her supervisory function. (1) The candidate has deep insight and knowledge and extensive experience in areas such as corporate management, risk management, compliance with laws and regulations, crisis management, financial accounting, internal control, macroeconomic policy (including finance and industry), organizational and cultural reform, or global management. (2) The candidate has the ability to get an overview and understanding of the overall management of Mizuho, the ability to grasp essential issues and risks, and the ability to appropriately interview management and express opinions to and persuade management, etc. (3) It is recognized that the candidate is independent from management of the Mizuho Group in light of the independence standards of outside directors of the Company (see the attachment for an overview of those standards). The Nominating Committee comprises mainly outside directors who are sufficiently independent from the management of the Mizuho Group and the role of the Nominating Committee is the matters set out in Article 15 and ensuring objectivity and transparency in the appointment of directors. 1. The Nominating Committee shall comprise no less than three (3) members. 2. In principle, all members of the Nominating Committee shall be appointed from among the outside directors (or at least Non-Executive Directors). The role of the nominations committee is made clear. It is made clear in the company”s business report that all members of the nominations committee are external officers. The reasons for appointing all of the officers are made clear. It would be even better if detailed appointment criteria were specified. “(iv) The Company is a Company with a Nomination Committee, etc., system. The Nomination Committee has the authority to determine General Meeting of Shareholders proposals related to the election and dismissal of Directors, as well as the basic policy, rules and procedures, etc., required for the election and dismissal of Directors. The Nomination Committee determines proposals regarding the composition of the Board of Directors for the next fiscal year and the requirements, etc., for independence and neutrality of Outside Directors and selects candidates for directorship. The duties, contents of activities, etc., of the Nomination Committee have been disclosed in Notice of Convocation of the 103rd Ordinary General Meeting of Shareholders (the Business Report ).. The election of Corporate Officers is an agenda item to be resolved by the Board of Directors. The Representative Corporate Officer and CEO proposes candidates to the Board of Directors (including the reasons for those candidates), and the Board of Directors elects the individuals. (v) In regard to the election of Directors, the reference documents of the Notice of Convocation for the General Meeting of Shareholders include the reasons for proposal of each candidate for directorship decided by the Nomination Committee. In addition, matters related to the independence and neutrality of Outside Directors confirmed by the Nomination Committee are also included. BDTI prepared an example CG Code report statement for Principle 3.1 (Sufficiency of Disclosure) as it might be written by XYZ Corporation, a fictional company that BDTI uses to illustrate potential best practices, concerning the policy and procedures followed by its board of directors with respect to nominating directors and statutory auditors (kansayaku), and also regarding the individual appointments and nominations made by the board. XYZ Corporation seeks to seriously implement the spirit of the CG Code by thoroughly considering the issues that the Code’s provisions are intended to address, in the context of its own firm. In order to prevent any future disagreement or laxity about its policies, and for simple self-discipline, it produces its own “Corporate Governance Guidelines” which it publicly discloses to society and its shareholders. These detailed guidelines are available in both Japanese and English, and the fictional disclosure set forth below is largely based on them. Nomination of candidates for director or statutory auditors (“board members”) takes place through a resolution of the board of directors and is based on the advice of an independent advisory committee comprised solely of independent external directors. Each year the independent advisory committee, after following the review process set forth below, advises the board of directors in writing of candidates for board member positions who satisfy the “Nomination Criteria for Board Member Candidates”. The recommendations explain the reasons for nominating each candidate. Where proposed candidates do not fulfill the aforementioned nomination criteria, it is explained why they should be appointed regardless of that fact. As the first step, separate interviews are held with each director, auditor, executive officer and other key employees, and based on the results and an evaluation of the board an analysis is conducted of the knowledge, experience and competencies currently held by the board of directors, as well as those aspects or qualities which should be reinforced on the board in order to help achieve the company”s management philosophy and goals. A needs matrix is created, or an existing needs matrix is updated to reflect the current situation, for each of the board of directors and board of statutory auditors, with the aim of forming a broad and appropriately balanced governance structure through the aforementioned process and making effective decisions. The needs matrix sets forth the kind of experience, knowledge, character and diversity that is sought. The independent advisory committee receives opinions about the needs matrix draft from the board of directors and the board of statutory auditors. The independent advisory committee searches for people fitting the needs matrix from a wide pool of candidates, both from inside the company, such as via the HR department, and from outside, such as by using executive search companies. No recommendations whatsoever are taken on specific persons before the needs matrix is created, however. The independent advisory committee deliberates and decides on a list of nominated candidates, submits it to the board of directors, and obtains their consent. Each year in the proxy materials for the general meeting of shareholders we specify (a) the needs matrix which has been used, and (b) clear reasons why each candidate for officer was nominated, and the role expected of them. We also disclose in both the Japanese and English annual reports a summary or skills matrix containing details of the current board members” skills and experience. the statutory auditors will be specialists in finance or accounting. The evaluations in this report are based on review of the Corporate Governance Reports submitted by each firm, and other disclosed materials referred to therein. The evaluations are not, and do not purport to be, comprehensive analyses of the actual status at each company. In order to ensure objectivity and fairness, the evaluations in this report are based on scoring criteria developed by The Board Director Training Institute of Japan (hereinafter, “BDTI”) itself. However, that does not preclude the fact that even then, subjective judgments must be made with respect to the nuances of wording in disclosed materials, or the overall impression created by disclosure statements viewed in their entirety. This report does not constitute advice for the purposes of making investment decisions or decisions about investment policy. In no case in which the reading of this report or its existence is asserted to have caused damage of any type shall BDTI shall bear liability or responsibility with regard to such damage. Readers of the report agree to waive all such claims in advance. Please observe caution with regard to the use of this report. As of the date of this report, BDTI does not intend to publicly announce the evaluation results of all companies or the exact scoring of any particular company. This report is not intended to be distributed to persons other than the person to whom it was originally distributed by BDTI, or other members of that person’s organization. Kindly please do not distribute this report or share it with such other persons, particularly on a wide basis. Only 26 of the 105 companies also disclosed English versions of their corporate governance reports or separate “corporate governance guidelines”.